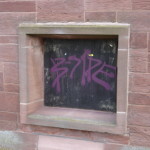 Vandals appear to have targeted Hoylake and sprayed graffiti in various locations during the night. 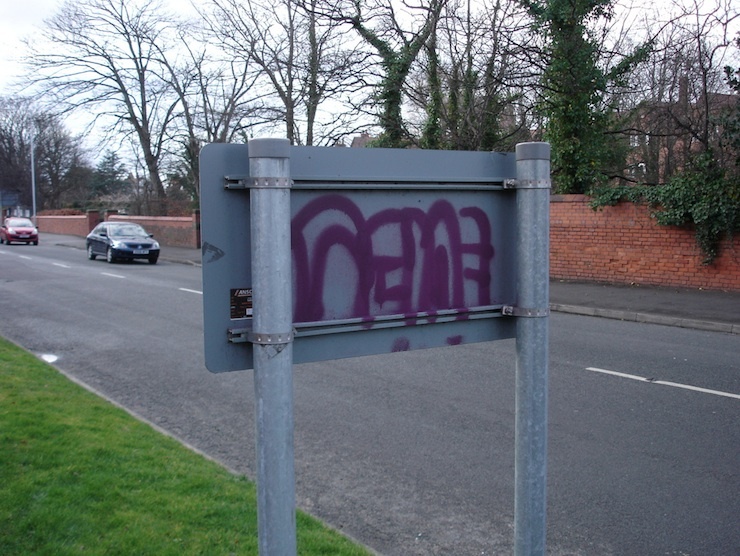 Buildings, shops, road signs, post boxes and street furniture have been sprayed with graffiti in areas around Carr Lane, The Quadrant and Royal Liverpool Golf Club. Owner of the Bodycore Pilates Studio Amanda Fryer-Harris arrived at her Albert Road studio this morning to find graffiti on her building and also on window shutters at Adams Wines store opposite. I understand that other businesses have also been vandalised. Street furniture on Market Street and road signs like the one picture above on Meols Drive have also been sprayed. I seem to remember that the graffiti on the pillar box outside Royal Liverpool was already there, but I’m not 100% certain? 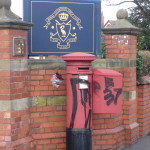 The pillar box on the corner of Pinfold Lane has previously been vandalised. While some graffiti can be considered to be street art, would you agree that what is pictured here is anything other than vandalism? Comments welcome. What is the point of the intrusive CCTV cameras if they don’t catch any of this? 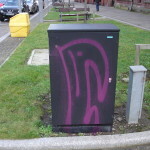 It’s been a very long time since there have been problems with graffiti in West Wirral so hopefully it is a one-off. I can’t remember any serious problems since the days of the “HAWK” gang in the late 70s/early 80s. There is still one example of their graffiti on Meols railway bridge, you can see it approaching the station from Manor Road before you go under the bridge. Random graffiti looks ugly and makes the surrounding area seem run down. 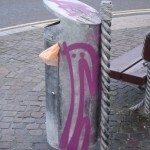 The people involved in this vandalism need to be spoken to, so maybe we should approach this another way. 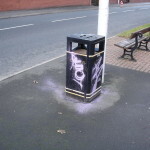 Is there an area in Hoylake or surrounding area that needs “brightening” up, graffiti could be used in a controlled manner to decorate, putting use the skills of a “bored” child but still setting boundaries? 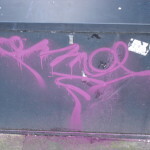 There is more graffiti this week – on the side of the Co-op and on a garage near to Cable Road. Both allude to saving the NHS which is all very worthy, but vandalising property isn’t going to save anything. Can’t really miss that on the Co-op wall can you!? None of the recent vandalism has been removed yet either. No, you can’t. Can’t believe not a single camera has picked them up!